Q: How would you characterize the main differences in making a film for Toho compared with making a film for Daiei or some other studio? SK: Between making Gamera at Daiei and Godzilla at Toho, the biggest difference is the amount of time we have to prepare. At Toho, we can only afford a short time for getting ready and for post production. Toho has their own theaters, so they want to release movies around New Years every year. Also, the Tokyo International Film Festival takes place early in November and they want a film ready to exhibit there, so as a result, filming time gets to be really short. That deadline is immovable. On the other hand, Daiei doesn’t have their own theaters, so they themselves can’t decide when they can release their films. They have to ask Toho to let them use their theaters. So they are in a weak position. As a matter of fact, when the director says that they can’t make a movie in a short time and they have a good reason, they understand. At Toho, their schedule is more important than what the director says. Toho has bigger budgets, they have more money, but Daiei can afford more time instead. Q: So the director has more creative freedom at Daiei? SK: I can’t say clearly which is which, but about the schedule, yes, that is the weak point about working for Toho. They know it’s not the right way to do things, but still the schedule must stand. The director has more freedom at Daiei in that respect. Toho has their own theaters, so they can think their schedule is secure. But at Daiei when they released Gamera 3 in March of 1999, they had to ask Toho two years in advance! That’s how the schedule automatically gets to be more flexible... because of Daiei being in such a weak position, not because their way of production is so much better. Q: So, Toho allows you more budget and resources, but at Daiei your resource is time. Which do you prefer? SK: For me, Daiei is better because time is more important. For Toho, they decided to make this film in January, so in total I had only 10 months for the whole job, while at Daiei I could get more than 1.5 years... almost 2 years to work on Gamera 3. Actually, I made another two films during the production time. Mr. Itoh was writing the script for part of the time, so I had nothing much to do. Of course I was checking with him and we were changing things. With Gamera 3, Mr. Itoh was struggling with the story...he just couldn’t make it work. Why? Because it was the third one, he wanted to create something new. It was the most difficult one. Q: In order to work on Godzilla, you first worked on CrossFire for Toho. Was this a valuable experience for you? Did it help you in making GMK? SK: Working at Toho on CrossFire, I kind of got a good feeling for the atmosphere there and I got accustomed to meeting and working with their staff. Most important was to be able to work with their office staff rather than the filming staff. 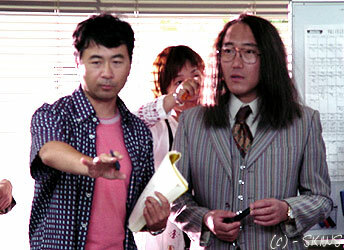 The old man Morichi, the casting director... those kind of people. Basically I was able to use the same office staff for Godzilla. Working on CrossFire, I could come to understand Morichi, the big guy, his ideas and what he was thinking about, so when it came to GMK, I got the idea that if I say something, I could anticipate his reaction. I learned how to ask for things. That really helped. As a matter of fact, film crews are basically the same everywhere, I know those kind of people. Even if the people change, they all think in the same way, so understanding the desk types, the top people, is a lot more important. Toho is a very conservative company. The most conservative film company in Japan. Q: You have said several times in the past that your goal was to be able to direct Godzilla. As a director, what is it about Godzilla that is so special for you to want to direct this particular character? SK: I have sort of a dream-like feeling, a special enthusiasm or admiration for a huge object, a giant monster. This is the first thing... it has a lot to do with what makes it special. As for Godzilla himself, he is ugly yet beautiful. Godzilla is unthinking and acts without regard for anything else, he just goes on his own way and does as he pleases... his violence is ruthless, he has incredible power. He is overwhelming. Other giant things like Gamera and Majin are not like that. They have some kind of motivation to go with their power. Not Godzilla. That is the biggest thing that makes Godzilla so special for me. Godzilla has been imprinted in my blood since childhood, not Gamera. Q: As a boy, did you see the Gamera movies? SK: As a young boy, I did not like Gamera because it seemed to me so childish. I only saw those films on tv; I never went to see them in a theater. Q: When you were young, were the Toho movies top quality to you? SK: People usually think kids don’t care about quality and those kinds of things. But as I remember, I did care a lot. I could sense it. Quality mattered, at least to me. So when I started to make Gamera, subconsciously I wanted to evoke those same kind of memories of 1960’s Toho quality. Q: In general, when you make a movie, what is the main thing that you are trying to accomplish? SK: The priority is that I am thinking of the audience...I want to make them satisfied. I have to understand the audience’s emotions and work with what they know, then thinking of what I have in mind, I try to lead the audience in that direction. That’s what I am always trying to convince myself to do. But it could just be an excuse that I am making up for myself. I might actually be just trying to satisfy myself, in which case it’s like making a private film. Q: When you make a monster film, does what you try to do change in any way? Are there special demands on you? SK: In a monster movie, I have unlimited ideas. So many visual ideas. All of these ideas pop out everywhere all the time. I really enjoy that. It gives so much for me to think about. But I can’t use all of my ideas... it’s impossible. The hard work is deciding which I will use and which I will dump. That’s really hard. On the other hand, in a regular film, there is nothing like unlimited ideas. I only have a set number. There’s not much cutting down of the visual ideas. So I have to depend on my technique to make this kind of film interesting. That part is fun. I can’t say which kind of film is better. Q: In your original concept, there were three monsters to oppose Godzilla—Varan, Baragon, and Angilas. Why did you pick these three? They are all so similar in that they are crawling monsters and do not possess any special powers. SK: When I think of domestic monsters for this story, monsters which could be indigenous to Japan, I think of these three. I thought enemies with a similar appearance would work well within this story concept, so that is why I picked them. I didn’t want to show the other monsters to have any special powers to instead emphasize Godzilla’s powers, so I went for monsters more on the quiet side. I wanted Godzilla to be King of the Monsters. Then, Toho’s chairman, Mr. Matsuoka, who is a more powerful guy than the president of Toho, ordered me to use Mothra and King Ghidorah. He is the top guy in all of Toho. If I used Varan, Baragon, and Angilas, which are simpler creatures, I think that the monsters would have seemed weaker next to Godzilla. That would have been more obvious. Q: Now that the movie is done, do you think the decision to change the monsters helped? SK: Yes, it was the right decision economically.... for selling tickets. That is an important thing for me. As a director, that is my job to think about. But still, in the bottom of my heart, in a very small corner, I still have the feeling that Varan, Baragon, and Angilas..... could have been better. Q: What is your strongest memory from production? SK: The day that we shot Yuri falling from the window, the special effects shot we did in Stage 1 (the Yokohama Sky Bridge window). That was such a great set. First we shot it, Chiharu spun around and fell, but there was a problem. So we had to reshoot that scene. But I really liked the shot where she turned around. Toho builds wonderful sets like this one... they were fantastic. Earlier I said that working for Daiei was easier, but Daiei does not make sets because of the budget. They just say, “Go to location.” But here they built this great set, just for one day of shooting. In the case of the Satsuma submarine, we went searching for a set for the ship’s bridge. Before shooting, we went to a ship museum. If it was Daiei, they would say to shoot there. If it is Toho and the director says, “Hmm, I want a set, it’s a problem at location...I kind of want it,” they’ll make it. Q: Other than in 1954, in Godzilla films they usually do not show personal violence or scenes of death and injury or the aftermath of the monster’s attack. You know it happens, but you just don’t see it. In this film, you added those kinds of scenes. Did you have a special purpose in mind for doing this? SK: What I thought is that, if it is not realistic, it would not be much fun. I did this in order to give more expression to the power and fearsomeness of Godzilla. If you don’t see anything, then you can’t tell. But at least I took care not to show blood. I didn’t want to make it like a splatter movie or anything like that, but I needed these scenes for showing Godzilla’s power and creating fear. I thought that the audience could relate to this kind of scene, like someone sobbing, more than just Godzilla fighting and beating the other monsters or buildings falling. You can’t show just sobbing and so on either, because it’s boring. All sfx or all people won’t get a response from the audience, but the combination of the two really illustrates the terror that is a monster. For example, during the Yokohama battle when Chiharu Niiyama or the military were injured or in danger, in doing that kind of scene, I am trying to create the feeling that these people are actually in a battle. If it was real, she would be dead, but in a film it’s more important to be interesting or exciting. It’s a movie, so that’s life. Q: Tell me about your cast. What special qualities do they have and why did you pick them? SK: About Chiharu, I’ve had my eye on her for several years. She used to be the typical idol star. Now she is growing into a real actress. I wanted to get her at that ‘balance moment’, the transition between idol and actress. I went to one of her idol events last February. Do you know that kind of handshake event? You all stand in a line and get to do a handshake with the idol. I went to see her there, observed her at the time, and I thought... well... she could work. She will be interesting. That’s why I picked her. She did very well, better than expected in fact. She was especially good at riding a bicycle. She was great in that crane shot where she was riding and shooting with the video camera. She was great. Before that, assistant director Shimizu couldn’t do it at all. As to Uzaki, well, I thought it best that this character did not look like a typical soldier or military type. In the last sequence especially, this is the spot where he does a kind of kamikaze attack... if it was someone who looked like a real military guy, then the theme might change. That could make it take on a kind of right-wing feeling. Q: Since he wasn’t a professional actor, was there any trouble in directing him? SK: It was very difficult. Sometimes he would lose his line or he would not be able to speak well. He could make up for the qualities he was missing with his personality. Basically he is really a very honest, hard working, and nice guy. He is a very positive person. He tried really hard. Of course it was hard, but it is a director’s joy to labor on something difficult and make it work. Concerning Kobayashi, when we were shooting, I got a little frustrated with him sometimes. I picked him because I thought he was just a straight handsome guy. A cool, good-looking guy. That’s what I wanted him to be. By using the effects of wardrobe and directing and all, that’s what I wanted to get from him, but I couldn’t quite succeed. I cast him by seeing a videotape which the Toho casting director showed to me. “How is he?” he asked. “Mmmm... OK,” was my answer. His performance was OK, he looked good. That is his talent. Q: Remember the Yokohama location and everyone was laughing when Kobayashi was coming out of the car to meet Chiharu? SK: Yeah, he was. Did he mean to do that? In that scene, I wanted him to act like a cool guy, straight and calm under all the chaos around him. And that’s how I directed him to act too. But Chiharu started to laugh, then everyone started laughing, and so it never worked. Every take was like that. That was a mistake; it just didn’t turn out the way that I wanted. SK: Ahhhh... Amamoto. Since the time that I was working on the script, he was exactly the person that I had in my mind all along. I thought, this line I want him to say. Did you know that he lives upstairs from a family restaurant now? I asked a Toho guy to bring the script to him. No one knew where he lived. He is always sitting in a family restaurant named Jonathan’s, not too far from here. Mishuku Jonathan’s. His performance was perfect. He is just like a monster.... Godzilla, Baragon, King Ghidorah, Mothra, and Amamoto. Q: That’s what I feel is the best acting in the movie, the performance at that moment. EG: Yes, we were there on that day to see Amamoto’s scene in the jail cell. It was really great to watch him acting, so intense, and he seems to need no direction. Even after a long setup, you just said “Go” and he did it perfectly. SK: That was my birthday. I ate cake with Amamoto. No Chiharu... He likes to eat cake. Q: What was the most difficult moment in production? SK: The hardest time was at Hakone when Chiharu and Kobayashi are watching Baragon. First of all, it was misting. The sfx shot was taken on a ‘pikan’ day (a fine day with no clouds). The problem was the weather. It was like Los Angeles. Q: That sounds like my experience... whenever I go to Hakone, I can’t see anything. Just clouds and rain. SK: Yes. We changed the location because Hakone is always cloudy. But still, on the first extra day it was all day cloud cover. Also on the second day, it was cloudy. But there was sunshine for about five minutes. So I took five shots in five minutes. Ok... ok... ok... It was so tiring. But more difficult than this was before shooting, getting permission from Toho to give the ok. Actually, the difficulty was that, since I once had said it was ok, I had to come up with some reason or excuse to negotiate with the producer for reshooting that scene. The business side knows what I mean, and I understand their side as well. Once I said ok, I am in a weak position. I can’t just pack it up. So there’s a debate...with Mr. Honma and Mr. Tomiyama. My point is that I may have said ok, but I really didn’t mean it. I was forced to say that because of the time I was allowed...I couldn’t afford more time. So that’s actually Toho’s fault. It isn’t like I hate Tomiyama or anything like that and it doesn’t mean he does not like me. That effort itself took a lot of energy. That was the hardest part. Anyway, this made the shot better. If I used the shot the way it was done at first, the background would have been just white. Q: Some have objected to having fantasy be a main theme of a Godzilla film, rather than just science fiction. How would you respond to such criticism? SK: What I think is that the meanings of fantasy and science fiction have been changing over time. I have to say that monster movies are actually fantasy themselves. Nowadays, I think monsters cannot exist in science fiction. That’s because now science has advanced and the audience knows so much more about science. Back in the 1960’s, a 50-meter monster could have been in science fiction...we really did not know if it was impossible. But now everyone knows a 50-meter monster can’t exist if you think in scientific terms. Q: Do you mean that monsters created by the atomic bomb in the 50s were within the realm of science fiction, but today this is regarded more as fantasy? Q: When you accepted the job to make Godzilla, did you intend to make just one movie, or was there any idea from either side that you would make a series or more than one? SK: Just one. Tomiyama’s original plan also was that GMK would be the last Godzilla film for now. But now the situation has changed. I don’t know what his plan is at this time. So yes, we both thought that I would do only one movie originally. Their plan always winds up being changed. 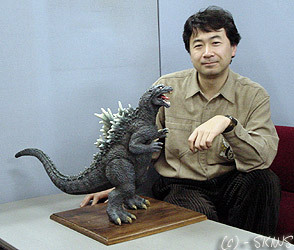 Tomiyama planned to make three Godzilla movies for the new millennium. At the time of Megaguirus, they were stuck and they did not know if they could really make another. But then they ok’d GMK, and he really thought that would be the end. But GMK became a hit, so he said, “Ok, let’s make another one!” It’s always this way. Q: Would you like to make another Godzilla movie? SK: Oh, yes! I would like to make another Godzilla. Q: Would you do it under identical conditions, or would you want more time? SK: If I am not doing something, then I’d do it even under the same conditions. Q: Do you think you’d have more freedom next time since this one was a hit? 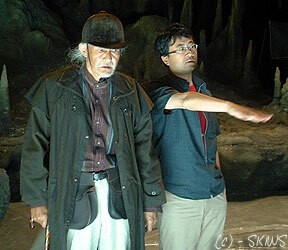 Q: On the original presssheet, the chart for both director and special effects shows ‘Kaneko’. You were going to assume the dual role of sfx director as well as director of GMK. It had not been done before. Could you comment on how that worked out? SK: I didn’t like that. Because of time, I couldn’t do as much as I originally thought. So I changed my mind along the way, and I thought Kamiya should get his due, so I made sure he got credit as special effects director. As a director, the hardest part of making a movie is developing all my ideas. When I leave the special effects to the sfx director, I still feel that I want to control him in the direction that I am thinking. That takes a lot of effort. So I think that it could be much better if one person could handle everything for both sides. A movie is something created from a lot of people’s ideas and time, not just one person’s. It’s good to get ideas from others, but the director should be the guy in charge. A director has to have the capacity for understanding and patience in order to deal with the other people involved. The director should be just like a slime... they have to change form case by case. So a situation changes and the director must change accordingly. Of course there are some directors who cannot change... they just get more and more stubborn. I think I am more flexible... I can be like a shape-shifter. I feel like I want to do more of the special effects part, but I know I can’t do everything. Q: Would you like to try this kind of arrangement again? Interview conducted 2002 in Tokyo by Ed Godziszewski and Norman England. Interview first appeared in Japanese Giants #9. Reprinted by permission.